Join your children in learning how to determine the most reasonable cause for everything we see in creation with a real-life detective! In God’s Crime Scene for Kids, J. Warner Wallace shows kids ages 8 to 12 what skills are needed to solve Jason’s mystery. Jason uncovers a mystery in his grandmother’s attic. He and his friends, Hannah, Daniel and Jasmine, enlist the help of Detective Jeffries at the Jr. Detective’s Academy. Your kids will look at evidence in the universe that demonstrates God is the creator and ultimately learn how to make their own case for God’s existence. Help your kids become detectives who investigate creation for signs of God and His creativity by entering to win the Mystery Investigation Kit! Enter today by clicking the icon below, but hurry! The giveaway ends on August 31. The winner will be announced September 1 on the Litfuse blog. Hone your reasoning skills as you investigate evidence in the universe to determine the most reasonable cause for everything we see in creation. In this companion to Cold-Case Christianity for Kids, Jason uncovers a mystery in his grandmother’s attic. He and his friends, Hannah, Daniel and Jasmine, enlist the help of Detective Jeffries at the Jr. Detective’s Academy. Along the way, they develop the skills needed to investigate the mystery and the evidence of God’s existence. The cadets learn logical-thinking skills as they examine the contents of a mysterious box and the vast universe. In God’s Crime Scene for Kids, real-life detective J. Warner Wallace shows kids ages 8 to 12 what skills are needed to solve Jason’s mystery, and at the same time looks at evidence in the universe that demonstrates God is the creator. Ultimately, kids will learn how to make their own case for God’s existence. 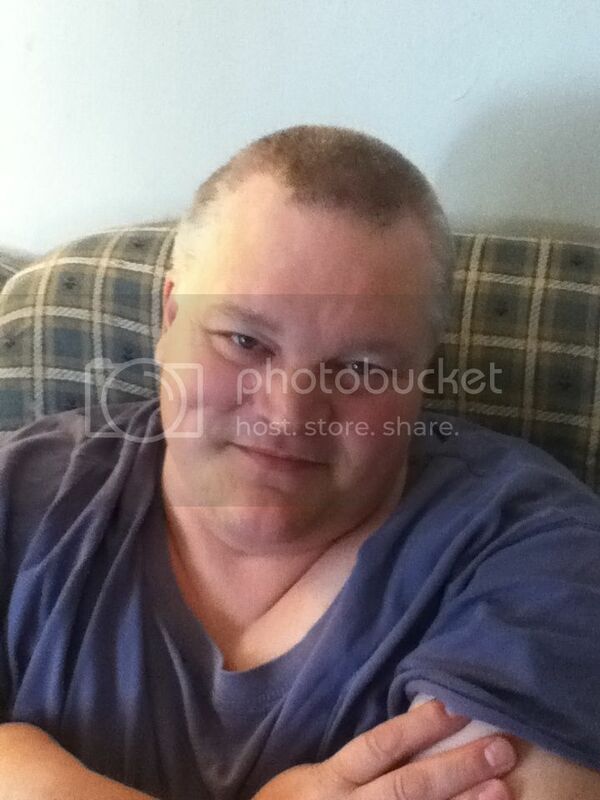 Find out more about J. Warner and Susie Wallace here. This is a fantastic book for children using a ‘real-life’ mystery, Detective Jeffries helps the children in his Junior Detective’s Academy to prove God’s existence. The book has a lot of pictures which is great for visual learners and CSI assignments in the margins have children digging into the Word for clues and answers. There are detective definitions, a tool for their ‘bag’, and digging deeper areas in little boxes in the margins. Visit Cold Case Christianity for Kids to view videos and print off pages to make a detective notebook that goes along with the book. Even I enjoyed this book and it gave me more ideas on how to talk to my children when they ask about God. Before I begin this review I want to apologize, I’m very late – this is a child’s Christmas story book and as we approach the Resurrection seems a bit out of place but I want and need to write this. This is a very cute story recounting Jesus’ birth in a good Biblical way, it doesn’t try to weave in Santa, trees or gifts but sticks to why we really celebrate Christmas. The illustrations are cute and child like with the characters also taking on a child like appearance, something young ones can relate too. The story is short which is great for young attention spans who usually can’t sit still for long periods. At the end of the story are five short devotionals using the letters in the word glory – “Jesus came as a Gift, the Light, as the Only door, we can Rejoice in Him, Yes to God’s promises.” In each devotion there is a short reading, a prayer and family activities, one is to pick a favorite song about God and go caroling in the neighborhood. As always the activities are tweak-able, and as a home-school parent, I’m good at making things that won’t work the way their written, work for my family. This is a very cute children’s book and I have to say it’s the best at sticking to the Biblical account as I’ve seen in awhile. Please visit Aneko Press’ Blog Tour Link-up to see what other bloggers thought. What child does not love to receive mail? What if that child could receive, open and read his or her own personal mail from God? The Love Letters from God will invite them to do just that! Accompanying each story in this unique children’s Bible is a very special and encouraging letter, each tucked away in its own lift-the-flap envelope, just for them. 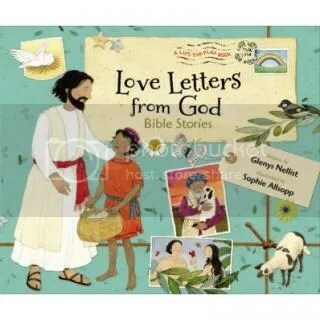 Written for children ages four to eight, the Love Letters from God includes eighteen of the most popular Bible stories—nine from the Old Testament and nine from the New Testament. Following each story the child will find his or her own letter from God. Children will love the excitement of opening the letters and parents will love how each letter elaborates on the Bible story being told. A very special Bible verse, entitled God’s Wonderful Words To You will accompany each story and letter. Much more than a mere memory verse, each carefully chosen promise will be God’s very own personal words of love, encouragement, and hope. This book will culminate in an invitation for the children to write their own RSVP to God. You can purchase a copy of this book at Zondervan. I enjoy books that bring Bible stories to life and make them relate to children’s lives – they are a great way to start instilling Biblical truths into the very young so they can grow in the faith. 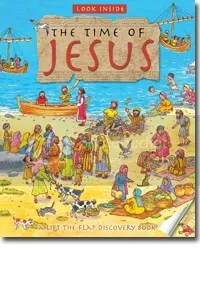 The idea behind this book is very cute – God is writing a letter to the child reading the book and relating back what is written in the story such as Jonah and the Big Fish, Daniel in the lion’s den, the Crucifixion and the Resurrection and others. The lift the flap idea works with those children who need to do to learn as well as the child who likes to see as they learn, and the darling illustrations are cute and attention keeping. The pages are quite thick and heavy duty which will help in the repeated flap lifting and page turning the young children often do, making this a book that should hold up to routine and constant use. If I were to use this with a child I would read the Scripture given at bed the night before and then the next morning read the story book with letter so it is a continuation. As I said I did think the overall idea of the book is a great one, and one could easily expound on ideas for their own children, such as the communion wine, as most churches I’ve gone to don’t use real wine and we don’t use leavened bread. Even though this is a child’s book we still have to be careful what we teach our children are God, His Word and His Son – of course it also needs to be done age appropriately as well. 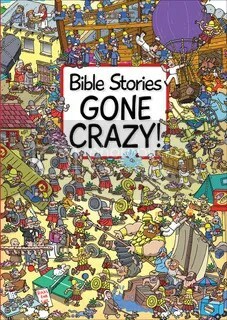 This is a cute, interactive book which will appeal to many Christians and it’s easy to tweak or subtract the ideas that don’t completely line up with the Bible 100% – if I were reading this aloud to a young child I would omit using the name Nathan in the feeding of the 5,000 but that is just me. Check it out for yourself in a store before you buy. I am combining these three books into one post as they are all by the same author and since I’m late getting them out I wanted to do this review in the fastest way. If you’ve followed my blog for any length of time you’ll know that I’ve reviewed other Captain No Beard stories and when the newest, Captain No Beard and the Aurora Borealis arrived on my doorstep I was very excited. Captain No Beard, AKA, Alexander once again sets sail with his mates, Hallie, Cayla and the other menagerie of excited animals on board the Flying Dragon ship. 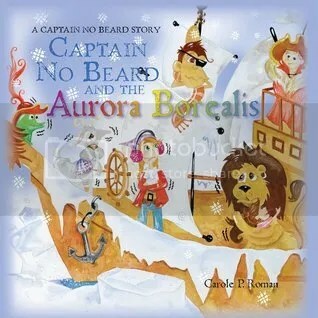 The premise is that Captain No Beard wants to capture and bring back the Aurora Borealis to his own bedroom so he can see it again and again, but the whole crew gives him a lesson in why he can’t do this – because to take something that doesn’t belong to you is stealing and it’s wrong. I’m not sure why his mom hasn’t taught him this lesson yet but at least his ‘crew’ knows right from wrong and helps to steer him right. Full of imaginative details this is yet another fun book that teaches character lessons for children and it’s good for all children as it can be used by Christians as well as those who are not Christians as it has no religious leaning. Once Captain No Beard and his crew moor back in his room, they use their imagination to create their own Aurora Borealis without stealing the real one. Lesson learned. 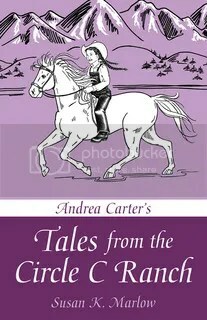 While I do prefer to use character building books that also focus on our faith this is still a very good way to add to those lessons learned and my son likes that there is a boy in the story he can relate to and the bright illustrations keeps both the reader’s and the one being read to attention. Parents, grandparents, and teachers alike will love opening their children’s eyes to the world around them in a fun and easy way—and they’ll be happily surprised when they end up learning a few things themselves. Fair warning, parents: your kids will want to start celebrating a new February holiday after reading this book. But don’t worry. You can always tell them you’re making a certain special, royal Incan dish for dinner. 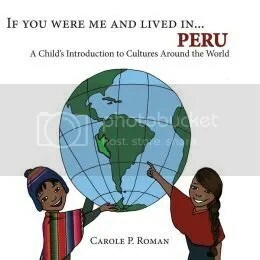 It seems lately that I’ve been reading a lot about the people of Peru, so it sort of delighted me when I picked up this newest addition in Carole P. Roman’s series, If You Were Me and Lived in…Peru: A Child’s Introduction to Cultures Around the World. Of course, it’s a child’s book so it’s not as definitive as the other books for adults I’ve read recently but I like the basic intro which is good for children of all ages – older children can use it more as a intro to lead them to more information. While I do enjoy these books I must add that it claims that the people of Peru have lived there for “over ten thousands years”, this is just a bit of FYI for my readers, who like me, believe in a Biblical view of Creation and don’t see the world as being that old. One other tidbit was that I cautioned my twelve year old as it mentions one of her favorite animals being used as food, this would upset her. Otherwise, this is a great look into the life and culture of Peru and like Carole P. Roman’s other books in the series it give the pronunciations of words within the text and there is a glossary at the end as well. It’s never too early to start teaching children about the world around them. In If You Were Me and Lived in…Greece , early learners get a taste of what their life would be like if they lived in Greece while being introduced to the birthplace of democracy. This book is the latest installment of the educational series about the cultures of the world that speaks to young children about the topics that interest them, such as the foods people eat, the names of boys and girls, and the activities that children their age living in a foreign land are likely to engage in. This exciting visit to Greece also introduces the important concept of democracy to children and highlights some of the other cultural contributions that Greece has made to Western civilization. Basic information is offered in a playful way that won’t overwhelm children. 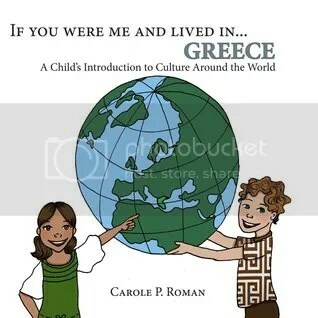 My mother-in-law’s family comes from Greece, there is a long story there but I won’t include it in this review for If You Were Me and Lived in…Greece: A Child’s Introduction to Culture Around the World but it was neat to read this with my children and learn a bit more about Greece especially on my 8 year old son’s level. This book touches on the Olympics and how wars would literally stop so that the men could compete in the sporting events and watch, maybe we should have more Olympics? I have to say that I’ve never heard of Greece being called “the cradle of western civilization” so I’ll have to do some more digging on that one since their are older civilizations who existed before Greece and I’ve always been told Mesopotamia has that distinction. With the in text pronunciations and the glossary at the end, the reading is easy and the hard words are easily learned and said correctly – although the Greek language is a hard one to decipher. The illustrations provide pictorial ideas of what is being presented and hold the attention of those gathered around the book. You can purchase a copy at WestBow Press. This is a very short book at just 102 pages – I read it in the time I waited at my son’s Cub Scout Den meeting, so about 1 hour. I really enjoyed the book, as it takes place leading up to the time of the Scopes trial – a time when those who firmly believed in the inerrant Words of the Bible against those who wanted to toss God’s Word out the window. Lulu and her brother, Buddy, have traveled to their Grandma’s house and as a time of simplicity leads to lots of outdoor time even during the hot temperatures of summer – time moves slower. The author captures this ideal perfectly and the love the family has for each other, even though Lulu and Buddy don’t always get along – the love radiates from the pages – love for each other and love of the Lord and His Word. That said, I wanted more – it was very simple, so it would be a good read aloud for younger children and a quick entertaining read for the older child. I would have liked to have more detail about what all Lulu and Buddy experienced before their dad and uncle came through to grab them back. I won’t give too many spoilers, as I hate that in a review, but the whole time machine idea intrigues me or maybe I’ve watched too many BBC shows, it would be great to go back in time – see the world as God creates it by speaking, the Flood, and even Christ as He works His earthly ministry. I hope that Tracy writes more books along these lines because I know my family and I will be reading them! Twelve-year-old cousins Sophie and Jessica don’t have much in common. Sophie loves hiking and her small town. 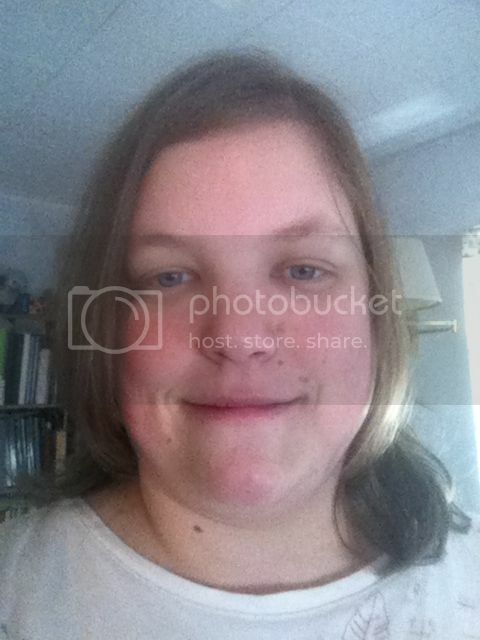 Jessica would rather be shopping in a city. The only mystery is how they’ll be able to spend the summer together. Then they find a briefcase in the forest with a surprise inside. When they hear footsteps behind them and bad guys run after them, they have no choice but to work together to solve the mystery of The Feather Chase. Visit Cousins Mystery to purchase your own copy today! Award-winning journalist Shannon Brown had the idea for a mystery for kids—a briefcase full of feathers—pop into her mind while driving on a busy freeway. The Feather Chase, the first book in the Crime-Solving Cousins Mystery series, was published in 2014. After writing more than 600 articles about almost every imaginable subject including opera, Daniel Boone, and her specialty of jewelry, Shannon switched her focus to marketing her book and writing the next book in the series. Originally from Anchorage, Alaska, she now calls Nashville home. If you’d like to connect with Shannon you may visit her website, Facebook, Twitter and YouTube. Usually when I set out to read a book that is geared towards ages 8 to 12 I make sure not to set my hopes too high because usually they are written in such a simplistic manner that would honestly insult my 10 and 12 year old daughters. 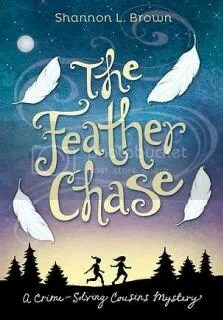 That is not the case with Shannon L. Brown’s book, The Feather Chase, and I am so excited to be able to share this book with you because it is just fantastic! 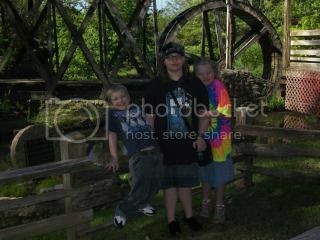 At first I didn’t think I’d like the cousins as one seemed a bit too bossy and the other a bit whiny, but as I kept reading the cousins really grew on me and I think the reason for that is that they are respectful both to their parents, aunt and uncle as well as others around them. That is hard to find in books for children today, as most of the children seem to act like their parents don’t know anything and treat others like they are dumb. 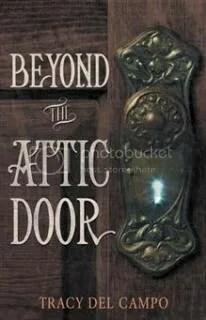 Since this is a children’s mystery book it isn’t as mysterious as an adult book would be but it definitely garners enough suspense to get one’s mind wondering what is going to happen next and the ultimate whodunit. While I also only limit myself to only the Christian genres, this book in and of itself is not Christian, so it can be read by those who share my faith as well as those who don’t. There is no ‘religion’ in this book, and even with that absence it was quite enjoyable and as I said the girls were enjoyable characters as they got along well even though Jessica doesn’t like nature and Sophie isn’t fond of make-up and primping. One thing I will mention is that Jessica does have a bit of a crush on a boy her age named Tony, there is no hand holding or kissing, but it’s evident when Jessica ‘forgets’ how to talk or blushes when he is around. The other aspect I liked about the book is that even the adults while maintaining their authority also respect the girls and help them as they seek to crack the mystery and solve the case. While some may think this is only for girls since the main characters are girls, I can see boys liking it given the mysterious plot involved – it would make a great read aloud for the entire family. 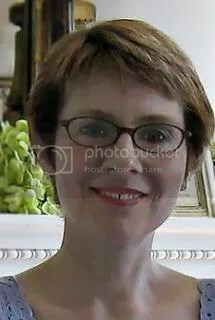 I also want to mention if you visit Shannon L. Brown’s website you’ll find a need little download to keep track of the clues as you read and then you have to predict if they are real clues or a red herring – lends a little educational flair to the book. Another exciting item to not is that she also offers a lapbook, for those who homeschool or who know me, we enjoy lapbooking in this house so I was very excited to see that offered to readers – it’s available as a PDF download for $7.00 on Shannon’s website. Mysterious footprints in the snow. Vanishing mittens, misplaced eggs. A pink, purple, and orange paisley sleeping bag on the move. 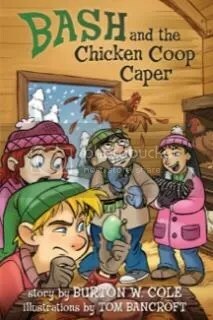 Something’s definitely amiss in the chicken coop, and wackiness runs amok on Bash Hinglebobb’s blizzard-blasted farm. While Bash is inventing such contraptions as a snowball catapult from inner tubes and underwear, his cousin Beamer Boxby, a city kid at heart, must help newcomer Lauren Rodriguez figure out why God lets horrible things happen to good people. Can Bash’s Farmin’ and Fishin’ Book (the Bible) be believed when it says, “We know that all things work together for the good of those who love God”? What about when fire rolls through an animal building. Or when a kid’s lost her dad? It’s time to find out—with a little help from an ice-skating pig. Find out how to purchase at Amazon or at B&H Publishing. I had the chance to review Bash and the Pirate Pig back in 2013 so when I was contacted to review Bash and the Chicken Coop Caper earlier this year I jumped at the opportunity. Geared towards boys ages 8 to 12 years old the story of Ray and his cousin Bash never fails to amuse even the oldest reader – I’m an adult and enjoyed the cousins antics although I wasn’t so happy that the parents seemed non-existent much of the time. It’s been snowing, a lot, and so the boys as only boys can do set out to gather a basket of fruit – Fruit of the Spirit that is. As boys gathering the Fruits takes on a life of it’s own as hospitality leads to a coop fire, a search and rescue mission for damsels in distress for goodness turns into a real rescue and more. Ray is more reserved than his cousin and while he knows he shouldn’t follow his cousin’s lead, he does and then wonders why – the boys ultimately realize they’ve forgotten to ask the Lord about any of their ideas to help others as they work on gathering their Fruit. As I said previously, the parents seem non-existent most of the time, Bash’s mom doesn’t really seem to know what to do with her very imaginative son and her nephew so outside they go. It’s mentioned several times she gets a nervous eye tick whenever she thinks of what they might get into. Ray’s parents drop him off and leave him for a week and we don’t really ever hear of them and Bash’s dad tries to discipline but it’s usually a grounding to their rooms. So I know it’s a kid’s book, but it would have been great to have more parental involvement – the most I read in this book was when the community couldn’t make it to church due to a blizzard and they all meet at Bash’s house to hold home church. Simple illustrations done by Tom Bancroft decorate each new chapter and the whimsical drawings add to that chapters feel. Overall, it’s a great book and ultimately the boys realize their mistakes and genuinely repent – since I’m always on the watch for good character building, godly books for my children, this one fits the bill and I know it will be read and re-read over the years.